​When we think of moisturizing, we automatically think of dry skin. However, people with oily skin need it, too, to help fight the drying effects of products that fight excess oil. It sounds counterintuitive, but trust me. So, without further ado, here are 20 simple DIY moisturizing face mask recipes that can replace your traditional creams and moisturizers to help keep your skin looking at its best. We may know coconut oil as a great moisturizer. But did you know it is highly antimicrobial as well? So aside from dry skin, it’s also great for acne-prone skin since it fight acne-causing bacteria. Honey is a great addition to this mask because of its skin-loving properties. Like coconut oil, it is both moisturizing and antibacterial, and it helps slow down the signs of aging, too. Combine the two ingredients in a small mixing bowl. If the mixture is too runny, try placing it inside the refrigerator for about 10 minutes to let it harden a bit. Cleanse your face and then apply the mixture on your face using circular motions. Let it sit for around 10 minutes before washing it off. As mentioned earlier, honey is packed with nutrients that care for the skin. Its moisturizing ability ensures your skin not only looks but feels soft, too. Coffee, on the other hand, is a great exfoliator. It removes dead skin cells for a brighter, more radiant complexion. Cleanse your face with your favorite facial wash. Apply the mixture on your face using circular motions. Let it sit for approximately 20 minutes before washing it off. Our first main ingredient is banana. It is rich in Vitamin C that contributes to better skin health as well as Vitamin A to repair damaged skin cells to make you look fresh and rejuvenated. Plus, it has almost 75% water content that helps hydrate the skin so it won’t dry out. Avocado, also called as nature’s butter, is rich in vitamins and minerals. It also has anti-aging properties as well since it plumps the skin to make it look younger and more vibrant. Mash avocado and banana in a small bowl. Add in the olive oil and your preferred essential oil. Mix them well. Cover your chest with a clean towel to avoid making a mess. Gently apply the mixture all over your face. Let it sit for 15 minutes before rinsing it off. Honey is a great emollient meaning it’s great for people with dry skin. It’s highly antibacterial, too, and helps fight pimple-causing bacteria at the same time. Baking soda works as an exfoliant. It gives pores a deep clean to unclog them, while removing dead skin cells to reveal a fairer, brighter complexion. Combine both ingredients in a small bowl. Mix well. Apply all over your clean face. Let it sit for 15 minutes then rinse it off. Bananas are great moisturizers. They are also known to increase the turnover of cells while providing some mild exfoliating action on the side. Almond oil is a great addition to this DIY because it helps calm irritated skin. And last but not the least, egg yolks contain zinc to alleviate skin inflammations. Mash the banana in a small mixing bowl using a fork. Add in the remaining ingredients. Mix well. Using circular motions, gently apply it all over your face. Wait for 20-30 minutes before rinsing it off. Oatmeal is a great exfoliant that sloughs off dead skin cells to reveal a brighter, younger skin. It is a good alternative to those synthetic scrubs we’ve all been used to. You can also add in a few drops of argan oil, but this step is completely optional. Gently apply it on your face and leave it on for 15 minutes. Rinse your face and apply coconut oil to help lock-in moisture. You might have avoided mayonnaise because of the effects it can have on your waistline. But today, you will start chasing it because of how it can put an end to your dry skin problems. Mayonnaise is an emollient which means it can be applied on any part of the body that needs a boost in moisture. It’s also tightens the skin (temporarily) making it great as an eye cream. Chill an adequate amount of mayonnaise for a few minutes. Apply it all over your fresh, clean face. Wait for 15 minutes before washing it off. We have already mentioned how great honey and oatmeal are for your face. But there’s one more skin-beneficial ingredient in this mask: milk. Aside from hydrating and replenishing the skin, milk is helps lighten dark marks. Since it has lactic acid, milk can help even out the skin tone to reveal that radiant glow. Combine all the ingredients in a small saucepan and cook for at least 5 minutes. Set it aside and let it cool. Once cool, apply a layer of honey on your face. Apply the oatmeal mixture. Let it sit for about 15 minutes before washing it off with warm water. I’ve already talked about how these three benefits the skin. 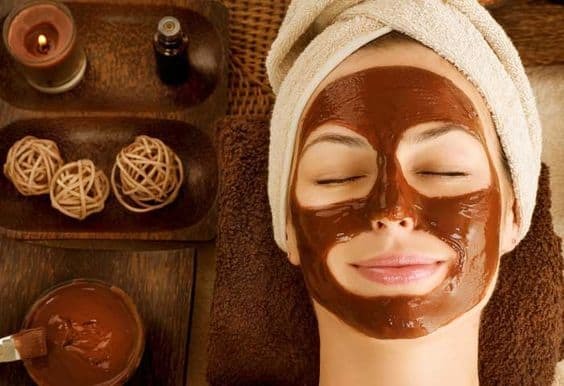 Cocoa rejuvenates the skin to make you look younger, while coconut oil and honey moisturizes the skin and are antibacterial. And they all come together in this face mask? Combine and mix all the ingredients in a small bowl. You’ll want to form it into a paste, so add more cocoa powder if necessary. Apply the mixture to clean skin and rinse it off after 15 minutes. Coconut milk contains Vitamins C and E to deliver deep hydration. On the other hand, Kaolin Clay is great at controlling oil but at the same time, it’s gentle enough for those with mature skin. Its last ingredient is Frankincense Essential Oil. It is especially great for aging skin as it helps reduce fine lines and wrinkles as well as tighten and lift the skin. Combine all the ingredients in a small bowl. Mix until you form a thick paste. Let it sit for around 10 minutes before rinsing it off. With a dash of olive oil and a hint of honey. Avocado is very moisturizing while olive oil effectively nourishes and cleanses the skin. It is then mixed with honey which is highly-inflammatory and lemon juice which is a natural astringent. Seriously. What more can you ask for? Dip a clean towel first on warm water and apply it to your face. This will help open up the pores. After about 3 minutes, apply the face mask mixture to your face. Why complicate things when you can combine these two and create your minimalistic mask? These two are both great moisturizers and have antibacterial properties to keep zits away. Combine both ingredients in a mixing bowl. Mix well. Cleanse your face and apply the mixture. Almond Oil is the ingredient of this mask that excites me the most. Almond Oil is great for acne-prone skin because it penetrates deep down to unclog pores and prevent future breakouts. A hypoallergenic oil, it can also help in cell turnover. Mash the banana in a small mixing bowl. Add the remaining ingredients and mix until you form a thick paste. Apply to clean face and wait for 10 minutes before rinsing it off. Being a coffee addict, I’ll admit that anything with coffee excites me. Coffee and oatmeal act as exfoliants to reveal a brighter complexion underneath. Yogurt, as I’ve mentioned, works as a great moisturizer. Mix well until you create a thick paste. Apply to clean face and wait for 30 minutes before rinsing it off. It doesn’t get any quicker than this. This recipe is great because you have an exfoliator and a moisturizer in one. Coffee sloughs off dead skin cell to reveal brighter skin, while olive oil delivers skin its much needed moisture. Combine the two ingredients in a small mixing bowl. Mix well. Apply to clean face using circular motions. Rinse it off after 3 minutes. Yes, that’s right. Being a great exfoliant doesn’t mean you got to have all those gritty stuff. High in lactic acid, yogurt not only nourishes the skin but sloughs off dead skin cells to reveal a fresher complexion. It is also great for acne-prone skin because of its antibacterial properties. You can also add a probiotic capsule to increase its anti-inflammatory power. Place the yogurt in a small bowl. Dip a clean cotton ball into the yogurt and apply it gently all over your face. Honey and coconut oil are common ingredients in these recipes and there’s no need to wonder why. It is a great humectant and helps lock-in moisture to restore your skin’s suppleness. On the other hand, avocados are packed with fatty acids that nourish and soften the skin. It also helps heal skin which has been damaged by overexposure to the sun. You can also add a few drops of essential oil of your choice. Mash the avocado in a small bowl using a fork until you get a creamy consistency. Apply all over your clean face and wait for 15 minutes before washing it off. Other ingredients of this face mask are green tea and essential oils. Green tea helps brighten the skin and fight acne-causing bacteria, while essential oils have a lot of skin-loving benefits. It is up to you which type of essential oil to use. You can customize this mask depending on the issue you wish to address. Combine oats and hot tea in a small bowl. Add in the honey and mix until you get a gooey consistency. Pour in a few drops of essential oil. Apply the mixture all over your face. Wait for 20 minutes (or until dry) before washing it off. You may know by now how awesome honey and yogurt are for your face. But cucumber? There’s a reason why cucumbers are often associated with spa days. Cucumbers soothe and calm irritated skin to make it look healthier and fresher. Combine all three ingredients in a blender and blend until you get a creamy paste. Transfer mixture to a small mixing bowl. Apply it all over your face. Wait for at least 15 minutes before washing it off. Shredded coconut milk not only acts as a moisturizer but as an exfoliant as well. It removes dead skin cells for an even and a brighter complexion. Its second ingredient, which is almond milk, has antioxidants that aid in repairing the skin. Royal jelly is known for its anti-aging effects by boosting the production of collagen. Combine all the ingredients in a small bowl. Mix until you achieve a hick paste. Apply mixture all over your face and wait for 15 minutes before rinsing it off.